Lia Schwartz, a German-born and a person of short stature, performed as the midget Lya Graf in the famous US circus, Ringling and Barnum & Bailey. 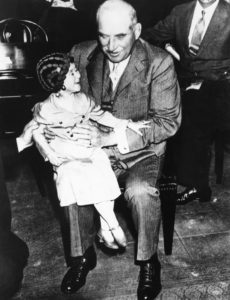 Graf became famous in June 1933 when, during a promotional campaign of the circus, she climbed on the lap of the Wall Street banker JP Morgan Jr. and had a chat with him. At that time JP Morgan Jr. was considered to be the richest man in the world. The photo of the meeting between “the Millionaire and the Dwarf” made its way around the world. But soon, Lya Graf, who was described as a sensitive and shy person by contemporary witnesses, did no longer want to live in the limelight. In 1935 she ended her circus career in the USA and returned to her home country, Germany, where the National Socialists were then in power. After the war, Nate Eagle, Graf’s manager at Ringling and Barnum & Bailey, investigated the fate of his former protégé. According to his investigations, Graf was arrested by the Gestapo in 1937 and taken to the Sachsenhausen concentration camp near Berlin. In 1941 Graf, who was not only a person of short stature, but also a half-Jew, was deported to Auschwitz, alongside her parents. There, it is said, both Graf and her family died in the gas chambers. Sources: Adelson, Betty M.: The Lives of Dwarfs. Their Journey from Public Curiosity toward Social Liberation. New Brunswick u.a. 2015; Chernow, Ron: The House of Morgan: An American Banking Dynasty and the Rise of Modern Finance, New York 1990.